Check this out . . . I just signed up. Let's run as many miles as we can March 9 to April 9. Put your legs to the test with GU. From March 9 to April 9, rack up as many miles as you can. The more miles you run, the more awesome your prize will be. 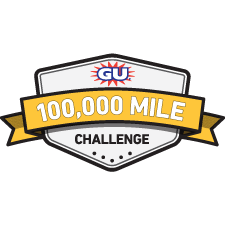 Most importantly, if everybody in the challenge runs a combined 100,000 miles within the 31-day period, all participants will receive a special GU VIP card for discounts (up to 35% off) and special offers on GUENERGY.com so you can stock up for the season. During the challenge, GU will randomly select 5 athletes who post inspiring photos and stories about their training to receive a special GU Gift Pack. All you have to do is post a photo or story about why you love running on the GU Facebook page. Good luck runners!